Are you in candy cane overload yet? No? That’s good, because I’ve got a recipe for you for a last minute gift. 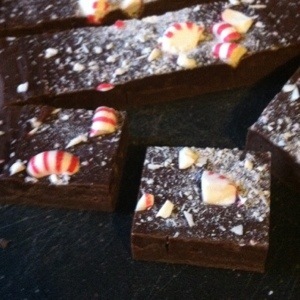 Peppermint fudge. I know what you’re thinking. Fudge? Come on, let’s be more creative than that. Well, I’ve never made fudge before, so this was an experiment all on its own. So I scoured the Internet until I found something that seemed easy enough that I could tweak to fit my needs. Then I went peppermint crazy. And I got some pretty sweet chocolate goodness. All with just a simple double boiler (a glass bowl over a pot of boiling water) and some chocolate to melt. Yum! Line an 8×8 inch pan with a piece of wax paper. In a double boiler, melt butter. Then add chocolate chips, condensed milk, and salt. Stir until mixture is smooth, about 6 to 8 minutes. Add the vanilla and peppermint extracts and stir until combined. Remove bowl from heat and pour into prepared pan. Careful, the bowl will be hot. Use a rubber spatula to evenly spread the fudge to the edges and smooth the top. Sprinkle crushed candy cane pieces over the top. Refrigerate the fudge for about 2 hours or until firm enough to cut. Remove from pan. Using a heated knife (run under hot water and dry), cut fudge into pieces. Refrigerate.